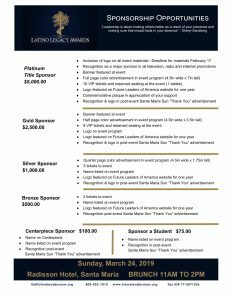 We are proud to announce the 4th annual Latino Legacy Awards on Sunday March 24, 2019 at the Radisson Hotel in Santa Maria 11am-2pm. The Latino Legacy Awards recognize Santa Maria Valley community leaders for their accomplishments and support of the Latino Community. Starting today, you can nominate local leaders who have made an impact in our local community. Nomination forms in link below. We look forward to reading submissions and highlighting the work of local leaders. 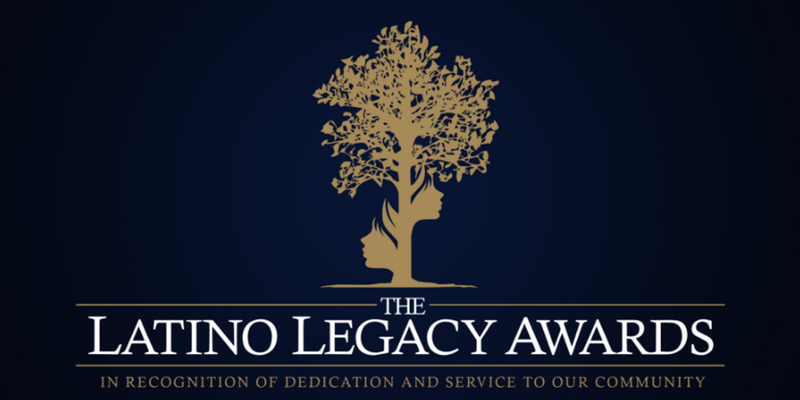 We invite you to be part of the annual Latino Legacy Awards sponsoring this year’s celebration. Over 200 people attended our inaugural event, making it a very successful start to a Santa Maria Valley tradition and a fantastic opportunity for visibility among local leaders, philanthropists and businesses. We hope you will join us as a sponsor of Latino Legacy Awards and help us raise funds for Future Leaders of America, a youth leadership development organization that provides leadership, educational and personal development opportunities for young people and their families. Your investment will ensure that we recognize today’s leaders and inspire tomorrows’. To show our appreciation and create a reciprocal relationship, as an event sponsor you will receive recognition and public visibility as listed in our sponsor flyer. For more information regarding sponsorship opportunities please call (805) 925-1010.